The most abundant vulture in the Western Hemisphere, the black vulture is a common bird of prey to see in southeastern North America and throughout much of South America. Often seen feeding on roadkill or other carcasses, this raptor serves an important purpose in cleaning up the environment and limiting the spread of diseases to other animals. Markings: Genders are similar with overall sooty black plumage that may show iridescent green on the back in good light. The head and throat are bare gray-black, wrinkled skin that may show dark hairs or patchy fuzz. Silvery-white primary feathers are mostly visible in flight but still show dark tips at close range. The legs and feet are light gray-white, and the eyes are a dark brown or dark orange. Juvenile birds are similar to adults but have less bare skin on the head and have a fully dark bill. The black vulture is an adaptable species that can be found in a variety of habitats including swamps, grasslands, open woodlands, agricultural fields, beaches and even urban and suburban areas. These vultures are typically absent from the highest mountain elevations or very dense vegetation, however. In the United States, the black vulture’s year-round range extends from Virginia and Kentucky to Arkansas, southeastern Oklahoma and eastern Texas, continuing south into Mexico. The bird’s range also includes all of Central America and South America as far as central Chile and central Argentina. In summer, some black vultures do spread slightly further north to breed in southern Illinois, Indiana, Ohio and Pennsylvania. Those same northern populations will migrate south in the winter, but most black vultures are non-migratory. The overall range of the black vulture is gradually expanding to the north and west, but slowly. Vagrant sightings have been reported as far away from the expected range as Maine, California and Wisconsin. These birds are generally silent, but juveniles in the nest have a guttural, low growling hiss. A breathy “woof” barking call can occasionally be heard from excited or agitated adults, and other vocalizations include grunts and groans, typically from nesting adults. These birds can be solitary but are more often found in groups, and they will occasionally form mixed flocks with turkey vultures, particularly when in search of food. Black vultures have keen eyesight but a less developed sense of smell, and they will often follow turkey vultures to a food source. They can be aggressive around food and will chase off other carrion-eating birds. They can also be fearless around a good food source, and may run with a bobbling, awkward gait on and off the road when traffic passes as they feast on roadkill. These are communally roosting birds, and they can often be seen perched with their wings spread for sunning, especially during the morning. The black vulture’s flight features choppy, uneven wingbeats and short glides. When threatened, they may regurgitate before taking flight to lighten their weight for a more effective getaway. These are monogamous, colonial birds that mate after courtship displays that include strutting and head bobs. They do not build a nest, and instead eggs are laid on bare ground or in a shallow depression in a cave, hollow stump, hollow log or abandoned building. Eggs range from light gray-green to light blue-white in color and have darker brown or purple splotches near the larger end. Only one brood is laid each year, and while two eggs is the most common, broods can range from 1-3 eggs. Both parents incubate the eggs for 36-48 days, and after the young hatch, both parents bring food to the hatchlings for an additional 75-95 days until the young birds can fly agilely. These are not backyard birds and while they will not visit bird feeding stations, they can occasionally be seen at large landfills or dumps. 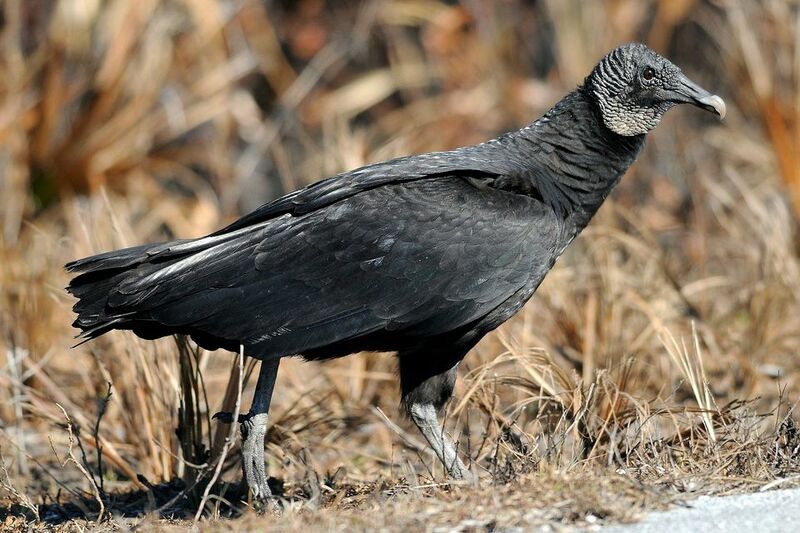 They are often spotted along roadsides where roadkill is common, and drivers should be cautious when approaching feeding black vultures to avoid hitting the birds. In suburban or rural areas, they may visit front yards along roadways if roadkill is present. In some areas, these birds can be considered a nuisance as they congregate in large flocks prior to foraging. While black vultures are not considered threatened or endangered, they can be at risk from DDT and other pesticide poisoning, as well as unintentional lead poisoning from the carcasses they feed on. Some nesting habitat loss can cause regional population declines, and farmers will occasionally disrupt the birds because they will, in rare instances, kill or harass newborn livestock. Vehicle collisions are also a threat in areas where these birds feed on roadkill. Overall, however, black vulture populations continue to expand and the bird’s range is increasing. Can You Name All the Vulture Species? What Are Key Facts About Vultures?